Lake Owyhee Reservoir is a 52 mile long lake in the high desert of Southeast Oregon where hundreds of potential dive sites have never been explored by divers. The canyon walls and valley make for interesting terrain to check out. This is an altitude dive due to the elevation of the reservoir. While diving in fresh water isn’t as interesting as all of the life in the ocean, Lake Owyhee is worthwhile to visit and dive if for no other reason than you may be the very first person to dive on a specific part of the lake. Very few divers ever make it to this part of Southeast Oregon. Lake Owyhee Reservoir is 52 miles of non-stop freshwater high desert dive sites. Someone with a pontoon boat and plenty of gas plus a compressor could spend weeks diving here and never see everything. This is an altitude dive. Please plan accordingly. There is a lot of boat traffic on the lake especially in the summer. Because divers are so rare at this lake, boaters will not be looking for or expecting divers. It’s a very good idea to have a dive flag with you and be careful as you surface. There are several parking areas at the boat ramps at Gordon Creek Boat Ramp, McCormack Campground, and Indian Creek Campground. The Owyhee Lake Road Pull-Outs do not have boat parking but there is car parking. Be sure to check with the campground and park hosts before parking to verify where they want you to park a car or a boat trailer. With 52 miles of reservoir to cover, Lake Owyhee is a massive site that can’t be captured in one simple description. Our only advice is to be careful of unexpected currents, boat traffic, and stay away from the intake structures on the dam. 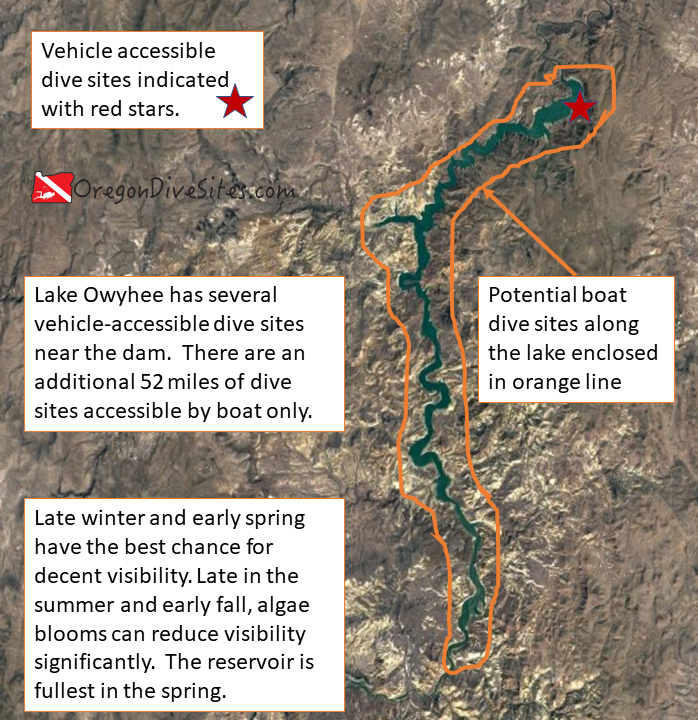 Depending on the water height behind the dam on Lake Owyhee, SCUBA divers may find water very close to the parking areas and lapping at the top of the boat ramps. On the other hand, during a drought year, the water might be 50 or even 75 feet below the top of the reservoir. In low water times, it can be quite the scramble to get down to the water. This is a fresh water dive site. While there are a few shore diving sites, the vast bulk of this dive site is boat-only. The only waves you will see at this dive site come from boat traffic. There can be some unusual currents in certain areas so do be careful. Depending on the time of year and how much water is flowing into the reservoir, you might find 30 feet of viz or 3 inches of viz. SCUBA divers may find algae blooms in the summer and early fall. In the late winter and early spring, a large amount of cold, clean water flows into the lake and usually provides better visibility. In the late summer, temperatures can get up into the low 60s. In exceptionally low water years, it can get even warmer. In the winter and early spring when cold snow melt flows into the lake, the temperature may be down in the mid 30s. Spring has the best chance for both good viz and a full lake. Unless you bring a shovel, you shouldn’t be able to find any deeper spots than about 115 feet. As you move up the Lake Owyhee Reservoir, the bottom comes up to meet the surface of the water. This dive site requires altitude diver training. We rate this as an intermediate dive site due to needing altitude diver training. Depending on where you go diving and how full the reservoir is, you might only have a few feet to walk to the water or several thousand feet down a steep slope. No surface swimming is needed. The submerged canyon walls are quite steep. There are several campgrounds around Lake Owyhee.